Well it's the end of our fantastic week! Our last full day in Lourdes is drawing to a close and it was a lovely day to close on! Breakfast out this morning meant a little lie-in for all and the short walk across town to the cafe helped build the appetite and everyone ate well and were really well behaved, as they have been all week! 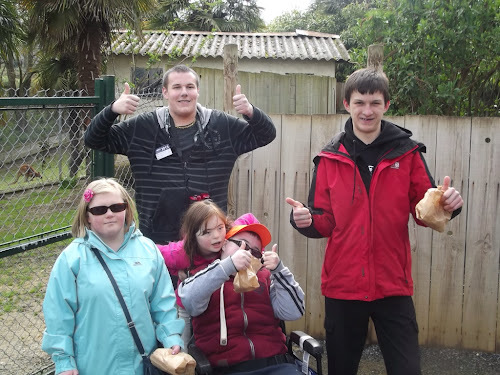 This afternoon was the Zoo, something all the children enjoyed, where they were all able to throw food to the monkeys and birds which helped bring them all closer to the animals and thanks to John we all learnt a lot about what we saw, as he knew lots about all the different species on show. The zoo is filled with birds off all kind, monkeys, peacocks roaming around the paths, wallabies (complete with a little baby joey's in the pouch!). There were red pandas, otters, tigers and leopards all easy to see and for some easy to feed! 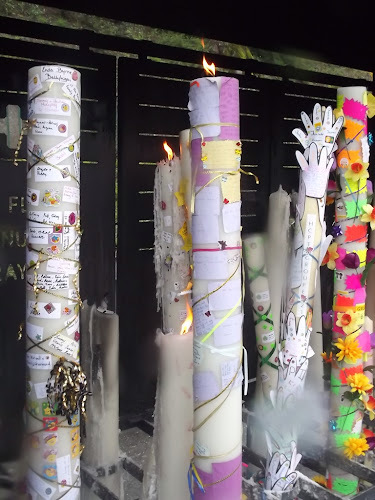 After the zoo it was back to the hotel to get our big candle blessed (remember I mentioned about the children decorating it ready) so we found a willing priest, in Lourdes this week you don't have to go far. Once blessed we took it down to the Grotto to be lit. All of our children and helpers had their own thoughts, prayers and wishes on the candle, along with many wonderful requests from home for prayers to be added. This is always emotional, for some, thoughts go out to their lost ones that can't be here today with us be are always with us. Our last dinner in the hotel was preceded by everyone making a start on packing up to head home and decide what is staying here for next year. Another birthday this week meant more cake for dessert but Happy Birthday to the wonderful helper Jen Jen, we all hope you had a good day, crazy lady. Everyone is really keen to get home and see our family and friends, not that we haven't enjoyed it here but I think you at home have all been missed? Thank you for the message we have been getting in the HCPT Tatler they were lovely and all the comments on here and Facebook have been great to see.